Everybody knows that the most important part of the day is the breakfast and fortunately this is also known by the Mexican cuisine. For this reason a wide variety of breakfasts that are nutritious and full of flavor can be found in this cuisine. Among the numerous dishes of this recipe book of Mexican breakfasts , one of the most popular and versatile ingredients is the egg . This ingredient can be found prepared in many ways and accompanied with endless ingredients. 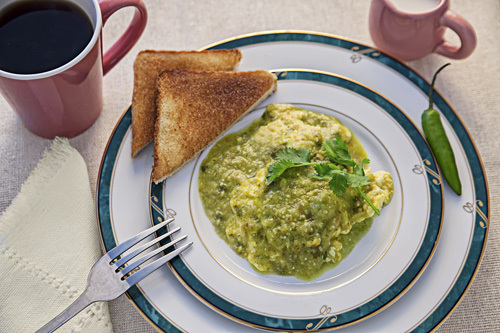 In this recipe the egg is presented scrambled and covered... well actually totally bathed in green salsa. It is a dish that is very fresh, full of flavor and spicy . When this breakfast is served, don’t forget to put on the plate some refried beans with some tortilla chips. To make this recipe first the salsa has to be made, then the eggs are made and at the end the eggs and the salsa are mixed. These are very simple steps that anyone can do. The salsa preparation is given with 1 serrano pepper. If you want a less spicy salsa use 1/2 serrano pepper. We give this recipe with olive oil so your dish has a better flavor. The eggs in salsa will be ready in about 20 minutes . The recipe is for 2 persons. Leave the saucepan ingredients cooking in the boiling water for about 5 minutes, until the tomatillos turn to a lighter color. Don’t cook the tomatillos for a long time because its skin breaks and its flavor becomes bitter. Transfer from the saucepan to a blender, with a kitchen spoon, the tomatillos and the chili that were cooked. Heat in the saucepan over high heat 1 tablespoon of olive oil. The Green Salsa that was blended. Mix the saucepan ingredients and wait for the salsa to boil. When the salsa boils reduce to medium heat and cook it for about 3 minutes, until it thickens a little; stir occasionally. Then set aside. Crack 4 eggs and pour them in a bowl. It is very important to pour the eggs in a bowl in case that an eggshell piece falls, it will be very easy to remove it. Beat the eggs that were put in the bowl with a balloon whisk or with a fork, until they are well integrated; then set aside. Heat in a frying pan over low heat 1 tablespoon of olive oil. Pour in the frying pan the eggs that were beaten in the bowl and cook them for about 2 minutes, until they are moderately cooked; stir regularly. Pour in the frying pan the green salsa that was cooked and cook the eggs in green salsa for about 3 minutes, until the eggs are well cooked and the salsa thickens; stir regularly. Suggestion: This is a perfect dish to accompany with bread or tortillas. Variation: The scrambled eggs can also be prepared with chorizo and they come out very tasty. Did you like the Eggs with Salsa? ✎ Try the Mexican Antojitos. ✎ Cook Vegetarian Mexican Food. If you have difficulties finding fresh serrano pepper, you can also buy it canned. It is also difficult to find fresh cilantro. If you don’t succeed buy this cilantro that has a good aroma, good taste and it is organic. To serve Mexican food your table also has to look Mexican and this set of salt and pepper shakers will take care of that.